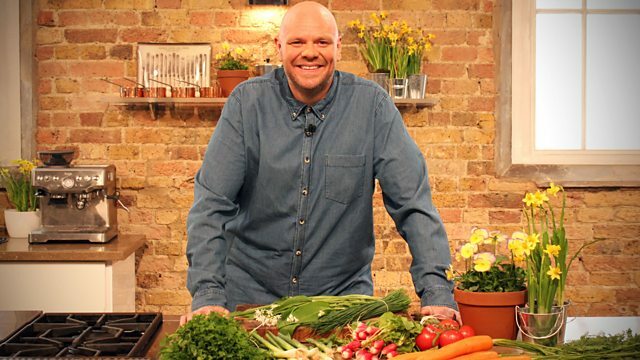 Tom Kerridge is joined in the studio by musician Paul Young and Michelin-starred guest chef Angela Hartnett for some great seasonal recipes and spring food. to get your taste buds going, and some lovely guests as well. It's time for Spring Kitchen. Hello and welcome to the show. We have a great line-up for you this afternoon. for a masterclass in fresh pasta with chorizo and peas. who makes spicy prawns with coconut, mustard seeds and chillies. and a super chef, it's Paul Ainsworth. all about the wonderful seafood that's on offer at this time of year. It's our very own fish man, Johnny Godden. -It's springtime. Are you happy as a chef, Paul? It is much lighter, fresher, brilliant. -Loads of lovely green things. Apart from fish. What sort of fish have you got? Is it a good time? The sea water is warming up, lots of different species are coming in. after his stints on Celebrity MasterChef and Hell's Kitchen. It's Paul Young. Hello, Paul, how are you? -All OK? Big foodie, then. -Finding lovely things to eat. -What a great way to find out. OK. So let's see what we've got on offer today. Paul, what are you cooking? I'll be doing you a lovely Cornish steak with a beautiful spring salad. PAUL YOUNG: I like it when you look at me and say that. You're doing ME a Cornish steak. -radishes, all with an oyster mayonnaise. Later on I will be doing a recipe with red mullet and cucumber. with a little bit of a beurre blanc sauce. And Johnny is here, because he is my fish guy. to be using mussels. He can tell us all about them. I'm going to cook and you are coming with me, Mr Paul Young. Come on, let's head this way. mussels cooked in white wine. because we have the West Country massive here. that sit there, flicking sweets at the teacher? That is those two. So if you get hit on the back of the head with something, it's one of those two. -I don't think you'd be far behind us, Tom! originally from the West Country but you've settled down there. which is instead of using white wine. This scrumpy cider has exactly the same sort of thing. It's a nice dry scrumpy cider. I'm going to get the mussels in. very quickly in the cider. Then we're going to use that cider to make a sauce. -The mussels, this time of year, good time of year? -They are grown off St Austell Bay in Cornwall, which you must be aware of? The rope-grown mussels are very good. They're very clean. and you let the baby mussels attach. And they let them grow. And they take about two years to get to that edible size. -It is quite a process. but two years seems like quite a long time. At a year, you could eat them, but they would be small. You want them plump, like they are now. So it is a good two-year cycle before you can eat them. with all the little attachments. And the girls don't like them. -They want a nice clean shell. so you have a nice clean mussel, no grit. Some of the best mussels come from Cornwall. You would argue that. Fowey mussels are very famous. but he has put them at sea. So what it is with Fowey, it's grade B waters. With these, they are farmed at sea and they are a grade A mussel. They are the best in the country, in my opinion. There you go, the best mussels in the country. You spend a lot of time down in Cornwall, don't you? -Paul and Paul, you actually know each other? It is like putting the band back together, it's like a load of mates. where they lent me the kitchen so I could do the photography for the book. and repair over to Paul's place once we had done our work. So you have done a cookbook? Yes, I did a cookbook about 18 months ago, I based it on my travels. kind of a side-effect of being a musician I had never thought of. and burgers, we would want to find out what was local and what was good. on the road or doing press - I hated doing press! They would book me a restaurant at the end of the day and go, "Don't worry, We're going there." the places that...food that represented the area you were in? we said to the cabbie, what was the best restaurant in Portland? Cabbies don't always know, but he told us it was this place called Jake's Fish Bar. and every American I have ever spoken to says they know that place. It was amazing seafood. Really nice. -but it was very special. -in Celebrity MasterChef and then Hell's Kitchen? if I could do this back home. to go to get New Orleans food. who was about the only well-known chef in the 1980s. and started doing it at home. from an American recipe book. They would put "heavy cream". -I thought, what is that? -Double cream or clotted cream. so it was coming out way too thick. because we are going to add a little bit of this dairy into our mussels! We have clotted cream, another great West Country thing. So this is known as VERY heavy cream. -I'll say. Double heavy cream. You have been doing a little bit of baking recently. The world has gone mad for baking. You have been doing a little bit of your own as well? and this year the idea was to have a bake club in the month of May. and put that money towards Cancer Research. These are cakes you have made yourself. Yeah...well, it was another collective. That's a lot of cakes. Let's see if the Michelin-starred chef likes them. because Paul Young frequently enters into your restaurant. -So you have to be nice about his cake. -I was nice about your courses. I need to start working with sourdough, I love that taste. Do you make sourdough, Paul? Do you do sourdoughs? -Yeah, on pizza bases. Reganos. -OK, so you do sourdoughs. Fantastic. some celery, and I have sweated it down in a little bit of butter. And then into that, I'm just going to pick a few of these mussels. These are great big, beautiful mussels. They have been de-bearded, cos nobody wants to eat them. it's going to be like a very posh open sandwich. because it's much underused - it's really fragrant and delicious. I've also done some chervil as well. We're just going to mix the whole lot together. Could you use clams for that as well? Clams, cockles, anything - any shellfish would work beautifully. For me, they're one of the most fantastic, beautiful shellfish. it's hard to get hold of them. OK. So, we're stirring this together, I'm going to season it. Mr Ainsworth, if you come over. because I have a shellfish allergy. I look at it and I think that looks absolutely delicious. You tell me if it tastes nice, Paul. It needs a bit more salt and pepper. You can go away now. You stay... You're not going to get the glory! I'm going to get the glory of plating it up. Could do with a bit more lemon juice. Only joking! If there's too much lemon juice, it's Paul's fault. Johnny, come on over. Have a little taste. How much cider did you put in? and you end up with this beautiful cidery, musselly clotted cream. I can't think of a better representation of the West Country. Clotted cream, cider and Cornish mussels. Get in there and start eating. Dive in and have a taste. Before you do that, did you eat one of those cakes? You haven't yet? Paul's saving that for pudding. The clotted cream's amazing, isn't it? for their take on spring ingredients. but first, they need some chorizo. which I love because we have so many fabulous ingredients. Great time of year for chefs. It is, and we're going to get really busy at the hotel. We're very lucky here to have all this produce on the grounds. We're also lucky to have this smokehouse. something a little bit special. A little bit special? OK! Looking forward to it. Then they'll dry out, and, after a few months, they'll turn into these. What's the spice mix in here? fennel seeds, coriander seeds, a little bit of wine. They will lose some of the weight. Yes, we want them to lose 30-40% of their weight before they're ready. We encourage this mould growth on the outside. and that's when we know that sugars are converting into acid. That's how we know it's safe to eat. and we're getting the results we want. -How long are they curing? They start at around 10kg. This is the slow food movement. We don't need to do anything with it, we let time naturally ebb away at it. We're looking for 30% weight loss. We're using the chorizo today, yes? Yes. We've got a couple of different types here. We've got a fennel salami - that one there. You can see the colour. This one looks just about ready to go. -This would be perfect for the recipe. which is going to be garganelli with home-made chorizo and peas. Talk us through the ingredients. we've removed the skin and it's ready to go. Lovely seasonal peas. We've podded them, ready to rock 'n' roll. A little bit of flatleaf parsley. You're going to be rolling the pasta. A bit of Parmesan and butter. Simple. Perfect. So, the first thing is to roll out the pasta. We make pasta with just yolks and 00 flour. Yes, it's the classic Northern Italian style. Explain the history behind the garganelli. Yes. Garganelli - we know it as penne pasta over here in the UK. We've got one of these lovely little garganelli boards. -it's great for attaching to cream-based sauces. We don't put too much flour in between it, just a little like that. it will stick together itself. Right, you're on that. I'm going to start doing the sauce. -I will jump over here. all we need to do first of all is to just square off the pasta. Around three or four centimetre rectangles. lay them on top of each other. This dish is so quick and easy to do. Even if you don't want to do your own home-made garganelli. You do all that while your pasta's cooking. so you get that nice finish. Yes. You can see how those ridges are going to take up that sauce. Right, so our peas are blanching. and then put them straight into the sauce. because you've got the natural fat from the chorizo. And a little bit of garlic oil as well. -It's a bit of a one pan wonder, isn't it? I love a one pan wonder. -Less washing up, all the better! We have some garlic in there and let our chorizo melt down quickly. I add some of the blanching liquid. We don't want it to be overcooked. Keep it still soft like that. Then we'll finish it as soon as we put our pasta in. Put the peas down there. -Yes, if you could, Chef. We'll get our pasta water boiling. That's ready to go. I'm going to put these ones down now. -Give me those last couple. Our chorizo is there. Add a little bit of our peas in there. A little touch of cream and butter, please, Luke. A little knob of butter. A little bit like that. Literally, I only added a tiny amount of cream and butter. Bit of parsley to add right at the end. Little bit of fresh pepper. Then our garganelli - just literally cooks in a matter of minutes. -You're just setting the egg yolk in there, aren't you? That's how you want it - all tossed together. And finally, a little bit of the Parmesan. You really cannot do without that. OK, right. A plate, please, good man. is be able to just pour the dish out. Little bit of fresh Parmesan on top. -So there we go. Fresh garganelli with peas and chorizo. Thank you very much, Angela and Luke. Most impressive was the salami shed! What more could you want?! It's somebody else's turn to cook, and it's going to be Paul Ainsworth. What are you going to be doing, chief? OK. I've got a lovely Cornish sirloin steak. Beautiful Dexter. which we were talking about earlier. St Austell, Fowey, we got these from Porthilly. We're going to make an oyster emulsion. I'll get going on that. You get going on your steak. And then we've got the radishes, the peas and the broad beans. We're going to do a salad. Yes, we're going to make it slightly different. but we'll keep it separate. And we'll have that lovely combination of beef and oyster. Beef and oyster, very classic. I've put the oil on the steak, as opposed to on the char-grill. So it's come up to temperature. It's almost warm in the middle already. OK. And I'm going to make this oyster mayonnaise. And then we'll slowly emulsify this water. Paul, you need to wash your hands if we're going to do this steak. -I'll have a little look. I'm just going to turn that for you. Now we're going to make this oyster emulsion. So, this is oysters, Dijon mustard, in a hand blender. That's it, until you get a nice, thick mayonnaise consistency. Exactly as happened in rehearsal! do you do any other dishes in the restaurant where you use that? Yes, we've got one on right now. We can pair it with lots of things. It's not necessarily always the oyster flavour. which is going to go beautiful with potatoes, radishes. and just let it beautifully caramelise. then the smoke is going back into the steak. So, this is like a tartare dressing. to go with our lovely spring vegetables. So that tartare is kind of a classic steak garnish. Padstow is very busy at this time of year. Easter must have been very busy? It was a long Easter and we're going into the May Day celebrations. It's a great time of year for us. -so it's nice to be busy again. Paul, have you seen a difference after the floods? That emulsion has come together, I've just put it in the fridge. Rest assured, it has actually worked this time! So these are radishes that you've brought from Cornwall with you? and he grows a good amount of vegetables for us. with all the different styles of radish that we get. and what are these long ones here? That nice sort of pepperiness. -I suppose this is like a mooli, is it? we're going to almost use that as our salad as well. You'll see, as this salad comes together. Our steak is just doing wonderfully now. Johnny, this time of year, what kind of oysters are these? These are the rock oysters. they're from Porthilly, an estuary that runs from Padstow to Wadebridge. so they get bigger and bigger. They're fantastic this time of year, really good quality. -Good. Do they need to be purged? and be UV-ed for about 48 hours to kill any bacteria in the shellfish. -So the oysters have to go on a sunbed! So, what I've got here, Tom, Cornish new potatoes. Right bang in with spring. We've got peas - I'm not going to blanch those. You know when you just eat them out of the pod? It gives the salad a lovely texture. -OK. So, this is a very raw, crunchy texture here? When you pop them, just pick the baby ones for the salad. Use the larger ones to make soup. Put some oil into this? Yes, some rapeseed oil into there, and a little bit of garlic. -Half a clove of garlic. So that's our steak. That's it. It's all about the resting. We'll just warm it up when we're ready to bring the dish together. OK, so just rest the steak up. Now, you're got lots of fantastic producers down your way in Cornwall. questioning the fact that your fish man is great, I love that! You know what they say, Paul! It's a fantastic area for farms and produce. The West Country is brilliant for that. And, as a restaurateur, to be based down there, it must be brilliant. we have an amazing butcher in Launceston. This steak is from near Truro. we're very privileged to have the produce that we've got. with great farmland, and surrounded by coastline. The best fish in the world. -Me and you, Paul, we've known each other a long time. and I was actually Paul's sous-chef in 1998. I was a sous-chef for the great Gary Rhodes. Paul was there as a fresh-faced young commis. He still has the fresh face - he still looks about 17! But he's grown up, gone on to great things. -and then for the great Marcus Wareing as well. And now has a Michelin star of your own. Yes. It's been a great journey. I've worked for some fantastic people. How are we getting on? so the juices run back through the meat. You don't have to heat it back up. I always get asked that question - if you rest it, it goes cold. It doesn't, just lovely room warmth. -I'll get the oyster mayonnaise. because this one actually worked! The one you made before was delicious! Slightly soupy! This is what I love about Paul being one of my great mates. but that doesn't stop him taking the Mick. -So, we need to get this out now, Paul. Oyster mayonnaise onto the plate. You've got your salad going. -I'll put the salad into the bowl. with that beautiful rapeseed. Another great British ingredient. Yeah, rapeseed oil is fantastic. I'm a huge fan of it. I'll just wash my hands and we're ready to go. -You're going to slice the steak. Get ready to eat, guys. I'm throwing peas at the cameraman! Sorry, boys! You can have them later! Going to put the salad on the side. Come on, guys. Come on up. Paul's slicing his steak. Let's hope it is not overcooked! Look at that, Chef. You taught me well! Then we dress it with the salad immediately. Dig in. You do not want it to sit for too long. We are just going to have that in there. Take some more of that lovely dressing, over the top. Almost like a salsa verde. -There we are. There we have it. Cornish steak, oyster mayonnaise and a beautiful spring salad. -Happy with that? Happy with that, Johnny? -Try a bit of that. -A bit of that oyster mayonnaise. back catalogue as Rick Stein rustles up some spicy prawns in India. There's something about a curry that's all pervading. Just the thought of it ignites a longing deep inside us. so wonderfully well with memory and imagination. No other food I know gives the taste buds such a roller coaster ride. more to curry than three pints of lager and a prawn vindaloo. it's time to cook a brilliant prawn curry I had at a restaurant in Kolkata. And as soon as I tasted it, I said, "I've got to cook that." Gosh, it's really hot today, but I love where I'm cooking. Now, I've just added some mustard oil into this very lovely pan. and you have to get used to the flavour of mustard seed. It's not like the flavour of our hot English mustard. but very, very vigorous flavour which is in all Bengali cooking. so they don't burn but they get this lovely brown colour. Then, in a blender, grind up a couple of ounces of mustard seed into a coarse paste. That'll give this dish of prawns and coconut a real hot zing. a bit of mustard husk in there. Good. Right, my onions are nearly done. Experienced curry cooks never overdo the turmeric. It has a way of dominating the other flavours. but if I was at home, I wouldn't hesitate to use a tin from the supermarket. And next, of course, the mustard paste. So even from this far it's sort of catching the back of my throat. the first time you taste something we're all a bit conservative. and then after a while you think, "I can't have enough of it". And that's the case with mustard. And next, the grated coconut. About a teaspoon of salt. Stir that in and now the prawns. And while it's cooking I'm just going to chop up some green chillies. The vexed question of whether you leave the seeds in or take 'em out. and my son Jack is testing a lot of them. "Delicious, Dad, but nobody could eat it. Too hot." The problem really is that I've just got a bit immune to chilli. and like our prawn vindaloo as hot as possible, leave 'em in. Thank you very much. That's your next-door neighbour. -Smashing in India. I love Rick Stein. seasonal ingredients that are at their absolute best this time of year. -seared cucumber. I need Paul Ainsworth to make a beurre blanc for me. That is the first thing you're going to do. Red mullet, this is a fantastic fish. Very seasonal. Quite hard to get hold of. Is that right, John? Really difficult to get hold of. and as soon as it goes into spring, they show up. -Very nice. Especially day boat ones like that. the slight yellow colouring on top of the fish. but red mullet have three yellow stripes going down the middle of it. disappear, so you know you have a nice fresh one when you see them. So you're looking for beautiful red and yellow. -Where do they come from? Just off Looe in Cornwall. They're only there for 12-15 hours, the boats. -That's not long in fishing terms. -A lot of boats go out for longer. Two to three weeks in some cases. -Imagine there are fish that are three weeks old. when it comes in it is fresh. You can get it to the plate quite quickly. Quite a delicious flavour, considering what it feeds on. If you knew what they sort of feed on. Yes, they are bottom feeders, but a lot of them do taste nice. You mean they are at the bottom of the ocean. -You always have to do that. They go down and feed off what is at the bottom, a bit like crabs. Crabs taste delicious as well but they literally are the dustbins of the sea. Red mullet are the same. But I think it's a really good, beautiful fish to eat. We have got red mullet here and it is in the pan. Instead of red mullet, you could use gurnard. Gurnard is a fantastic fish, again from Cornish waters. Yes, you get red gurnards in the summer months. they work very well, very similar to red mullet. A fraction of the price. to cook a little piece of cucumber. Not often that people cook cucumber. I have taken the top of it off and exposed the lovely seeds. I will put them in a pan, it has some oil in, and I am going to fry it. It is like, I suppose, cucumber popcorn, that flavour comes through. You can keep the cucumber for sandwiches. We are just doing it for here. Paul, you have a new album coming out. a band which I have had for 22 years. Longer than the Beatles, and still nobody knows us. Really, I didn't want people to know us. and promote it as, like, a side project. Do you sing in the band or do you play an instrument? I do both, but I wanted to get back to being in a band. The one thing I missed the most... I was a reluctant solo star. and I wanted to get back to being in a band. So it is kind of soul music? No, no, no. Not at all, it is just the feeling of being with your friends. -I did not want to just be the front guy. I am choosing Jamie because he sings and plays the guitar. Drew is a great songwriter with a lovely voice. He has got Amy Winehouse on one track and somebody else on another track. We write the songs, we choose the person who is good to sing that song. You could do something for the three of us. -All in blue shirts, all of us. We look like a band. A very bad boy band. You could be the dancer, Paul. It is so much fun to do. We've got stand-ins. Jamie is going to go off with Tom Jones soon. We had Jim Cregan, who was in Rod Stewart's band. playing bass couple of nights ago. they want to do it again. OK, so just a quick recap of what we have got here. really toasty colour, and that flavour almost goes nutty. and what Paul has done is made a classic beurre blanc. and covered them with white wine vinegar. -Do you need a whisk? Paul is trying to use a spoon rather than using a whisk. This is the great thing about chefs, we use a spoon for everything. Works for everything. It's not working with a whisk. what sort of food did you have? Quite basic food. My mum made a mean Irish stew. It was all the usual growing up things. I was slow to appreciate food. That did not happen until late teens, early 20s. beginning, all those kind of buttermilks in the pan boil. It steams it from the bottom upwards. but we have a lovely, beautiful red mullet there. The cucumber has been toasted and fried. It has that lovely flavour. which goes with fish very well. You could use that for any fish you wanted. It goes really well with most fish dishes. You could use smoked butter if you like. It goes very well. With meat, you could use a smoked butter dish, with perhaps chicken or pork. A bit of that cucumber, nice piece of fish on the side. -That sauce there. Look at that. Everything has been way better than in rehearsal. You can come back. Little bit of the butter sauce on the top. We are going to put some borage cress on there. so it has got this beautiful cucumbery taste. that can sit on the top. You've got this cucumber... Get in there and start eating. -Knives and forks, help yourselves. We have beautiful red mullet, beurre blanc, toasted cucumber. Get in there and have a little taste. Skin nice and crispy. The flavour of that red mullet is amazing. Very meaty, quite powerful and quite strong. Loads of "Mm"s. That's great. That is all from us on Spring Kitchen today. Paul Young. And of course, Angela Hartnett and Luke Holder. All of the recipes are available on the website. Thanks for watching. See you next time.